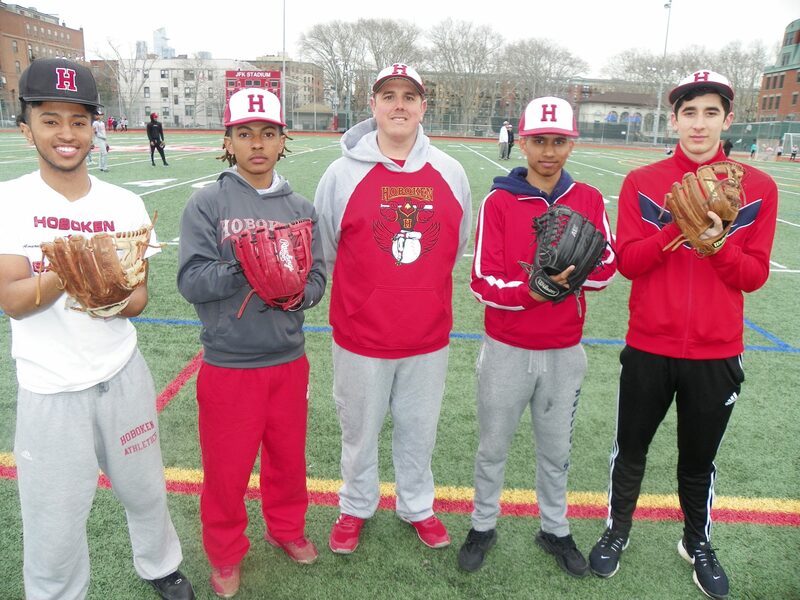 The Hoboken baseball team will count on its standout pitching staff, namely from left Victor Martinez, Michael Effinger, head coach Jack Baker, Yugal Pattni and Aram Assadourian. The Hoboken High School baseball team won 12 games a year ago, but veteran head coach Jack Baker is insistent that the Redwings will be a better team this season. Senior right-hander Victor Martinez was 6-2 last year, earning Hudson Reporter All-Area honors. Junior left-hander Yugal Pattni is also back from last year. Pattni won a game in the NJSIAA North Jersey Section 2, Group I sectional tournament last season. Senior Mike Effinger is an effective starting pitcher with deceptive stuff. Senior Arum Assadourian is another right-handed hurler. “He is a spot pitcher and he’s not bad out there,” Baker said. Freshman Ryan Burke will also get to pitch some quality innings for the Redwings. Junior Danny Henson is the team’s catcher. Senior Thomas Spadavecchia is Hoboken’s starter at first base. Senior Andrew Paredes gets time at first base. Senior Robert Cabrera had a great year last season and he returns to his spot at second base. Freshman Erik Carratini will see a lot of time at second base and the middle infield. Martinez plays shortstop when he’s not pitching. Assadourian can also play shortstop. Spadavecchia and Carratini will probably split time at third base. Effinger is in left field, where he has been a three-year varsity starter. Pattni and Assadourian split time in centerfield and right field is a battle between Arison Maldonado, a transfer from Louisiana, and Tori Bravo, who remains one of the only girls to be playing varsity baseball in the county. The Redwings were slated to open their season against St. Benedict’s of Newark and followed with a tussle against league foe Marist. But Baker is fairly certain that the Redwings will be improved this season.